SYNOPSIS: From visionary filmmaker Spike Lee comes the incredible true story of an American hero. In the early 1970s, Ron Stallworth (John David Washington) becomes the first African-American detective in the Colorado Springs Police Department. Determined to make a difference, he bravely sets out on a dangerous mission: infiltrate and expose the Ku Klux Klan. He recruits a seasoned colleague, Flip Zimmerman (Adam Driver), into the undercover investigation. Together, they team up to take down the extremist organisation aiming to garner mainstream appeal. Produced by the team behind the Academy Award*-winning˚ Get Out, BlacKkKlansman offers am unflinching, true-life examination of race relations in 1970s America that is just as relevant in today’s tumultuous world. Because we live in a peaceful nation in a peaceful time with generally no conflicts among the different races, we tend to take things for granted. BlacKkKlansman explores a dangerous time in 70’s America where race and colour is very much a big deal in this surprisingly light, funny affair helmed by the legendary Spike Lee (Malcolm X, Inside Man). 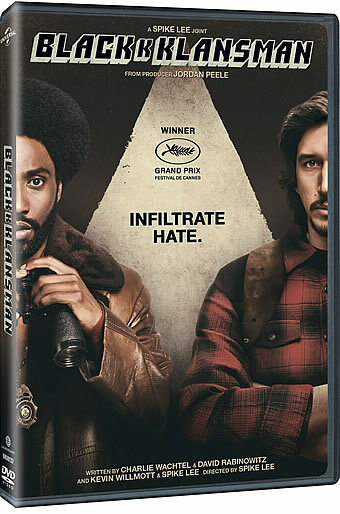 John David Washington (son of Denzel) plays a rookie cop, Ron Stallworth who posed as a white man to prank-call the local division of the notorious Ku Klux Klan while his Jewish colleague, Philip Zimmerman (Adam Driver) has to act as him to meet the Ku Klux Klan members in person. Thus begin a series of challenging investigative outings involving Stallworth and Zimmerman. The former backing the latter via a hidden microphone with Zimmerman trying his best to put on a false front to fend off a suspicious KKK member, Felix and also winning the trust of their leader Walter and their mysterious Grand Wizard and mastermind, David Duke (Topher Grace). Despite the heaviness of the topic onhand and the mostly dialogue driven narrative, Lee manages to deliver one of the most entertaining yet thought-revoking movies of his career. The sharp humour and almost campy tone is a brilliant way to bring his messages across without sounding too preachy or boring. Ironically the issue of colour is still relevant after so many decades if you remember the 2017 Charlottesville riots. Using the real-life Ron Stallworth’s memoir as a base for the screenplay, Lee made good use of the material to poke fun at white supremacy and racism although there’s a fabricated last act that solely exists to drum up the tension. A subplot between Stallworth and Patrice Dumas, a president of the black student union is less fluid compare to the much more intriguing, exciting infiltrative works of Zimmerman and Stallworth. Sounding exactly liked his dad, John David Washington making his first leading man appearance is full of charisma and magnetic. Both Adam Driver and Topher Grace puts in effective performances to draw you into Lee’s world. Same goes to the rest of the supporting cast who plays chilling members of the KKK. BlacKkKlansman is a perfectly engineered piece of compelling work that attempts to educate and entertain the masses at the same time. It’s a story that is set in the 70’s but the gist of it remains frustratingly relevant in today’s era. A Spike Lee Joint is a five minutes feature that has the real Ron Stallworth and talents liked Jordan Peele, Topher Grace and John David Washington talking about the casting, story and performance. BlacKkKlansman Extended Trailer Featuring Prince's "Mary Don't You Weep” is just a longer trailer that is set to Prince’s song. The Dolby Digital 5.1 soundtrack is clear and solid for the dialogue-driven movie. Even the occasional environmental sound effects are detailed same goes to the music tracks. Images are rich and sharp although some selective low-lit scenes looks murky. Overall, it looks serviceable on DVD if you are not particular about hi-res sound and vision.